It’s been two months to the day since Glenn entered the hospital, and one month to the day since his death. I’ve started to be overwhelmed by the number of things to be done, the number of decisions to be made, and that aspect of grief which precludes doing any of it because your brain feels like it’s swimming through molasses, and all you can do is sit and stare. Burning out, I opted for a change of scenery and routine. 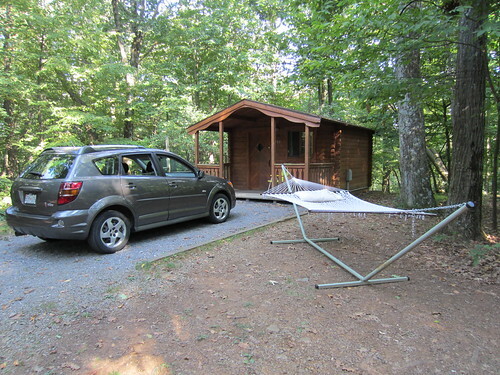 I decided to rent a camper cabin for two nights in Cunningham Falls State Park. These are small cabins with just enough room for a double bed and a pair of bunk beds. They have electrical outlets and an overhead light, a door which locks with a key, a picnic table and barbeque grill, and a water supply and spotless bathhouse a few steps away. Our parks have erected them in recent years on sites which were previously just for tents and RVs. (The campgrounds are now a mixture of the two types of sites.) They offer a chance to sleep in the woods to anyone who would be put off the idea by having to buy a tent, pitch it, and blow up an air mattress. It was a good fit for me. I wanted a couple of days away from todo lists, the Internet, phones, and unnatural light, and to test my capacity for consuming banana sandwiches. Most of all, I wanted to get away from clocks, to spend just one day with no idea what time it was. This was spoiled when I realized I’d made an appointment for Thursday afternoon, was going home Thursday night, and had to turn on the cellphone. It was a good run until then. I’d still like a few days when the sun runs the show, waking and sleeping on a natural cycle. I did, at least, spend the day with no plan, doing whatever I felt like doing next. (That turned out to be a little hiking, a lot of sleeping and porch sitting.) It wasn’t a vacation, but made a fine breather. I smiled many times at little sights and sounds and smells which brought back instant, vivid, and forgotten memories of summer camp, and delighted at how much cooler it was away from the city, under the forest canopy, with the breeze blowing up the mountain. It gave time to just sit with Glenn being gone, and let it sink in a little deeper. With everything that’s going on now, it’s the best I can do, but it did whet my appetite for something longer and more remote. These camper cabins are part of a ring of other sites, the nearest just yards from you, so don’t go into it expecting Walden Pond. No one was rowdy, but aside from the morning, there are always voices in the distance, and cars driving around. Some of the parks have larger cabins with kitchens, sitting off by themselves. I’ll plant packing off to one with a stack of books and a week of groceries as a dream in the back of my mind. It did strike me that, at $50 a night, these cabins would make a great alternative to hotels for travelers who don’t mind bringing their own linen. There were several good restaurants near the park, and a camp store for anything you forgot to bring. The only other commodities lacking would be the hotel room phone (who uses that anymore?) and cable TV. Maybe an evening of walking the woods or sitting at a fire with other campers would make a welcome change from dozing off to The Late Show.